Just discovered SQUARE! Will soon be able to accept your credit card if you don’t have cash or check! To start the week, we are serving a flavorful Creamy Red Pepper Soup. This soup has a certain taste that your taste buds will really enjoy. It contains organic half n half, so if you prefer it without that, I’ll use coconut milk, but you need to request this by Saturday. Avocado, cilantro, or goat cheese would make a great topper on this soup! 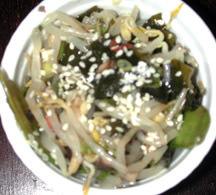 We’ll prepare some Bean Sprout Salad for your delight. Very low calorie and tasty; with sesame oil, green onions and a dash of sesame seeds. Need a bit more? In addition and by request, we are offering our yummy Mediterranean Lentil Salad for a command performance. A refreshing salad filled with protein, good fiber and delicious seasonings. The lentils are mingled with carrots, bell pepper, red onion, scallions, and parsely in a tasty dressing. You won’t be disappointed. Later in the week, try our Lentil Soup. Not yet a fan of the lentil? Trust me, you’ll like this, I guarantee. Filling and fantastic, just humble and not blinged out like those other trendy soups. It has all the veggies you want and plenty of flavor (no curry). 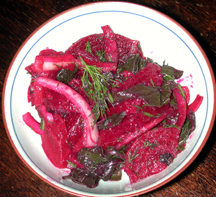 Along side, we offer the gem-like beauty, Roasted Beet Salad, with sweet onions and fresh dill. I have converted many beet-haters into devoted beet eaters. FRESH, low-calorie, and can be served warm or cold. 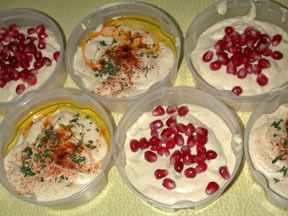 You’ll never get bored of our Homemade Hummus w/ Pomegranate. The pomegrante season is almost over, but I found more precious jeweled- seeds! Of all the earth’s natural substances, mushrooms are among the most medicinal. While researches are only beginning to understand how the many compounds in mushrooms can fight ailments ranging from infections to cancer, two compounds appear to rise above the rest: terpenoids, potent antiviral, antibiotic, and anti-inflammatory agents, and polyaccharides, chainlike sugars that enhance the immune system and may help the body fight cancerous tumors. All mushrooms are low in fate and are a good source of B vitamins, as well as fiber and protein. Many mushrooms also provide vietamin D, which helps the body absorb calcium and is present in few other foods. To start the week, we are serving an earthy Mushroom-Spinach Soup. This soup ain’t pretty, but sure is flavorful and rich-tasting! It’s pureed but still chunky with all sorts of mushrooms (boosts your immunities and lowers cholesterol). We have some Ratatouille to go satisfy you. 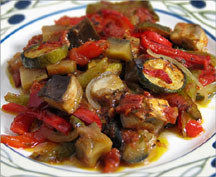 It’s a mediterranean vegetable stew with zuchinni, tomatos, eggplant, bell peppers, mushrooms, onions simmered in French herbs n spices. Julia Child would be proud! Later in the week, try our Gaspacho. This refreshing tomato-based soup is packed with super curative nutrition. Can be served cold or warm. Perfect as is, or great with shrimp or avocado toppers. Along side, is a southern treat, Collards with Brown Rice. We cook it with olive oil to make it a bit healthier with onions and tomatos, and about 1/2 cup of brown rice baked with a pat of butter. You’ll never get bored of our Homemade Hummus w/ Pomegranate. The pomegrante season is almost over, so orders are filled upon first request. Don’t dispair, I’ll have some Spicy Hummus to fill your tummy if we run out of the other. 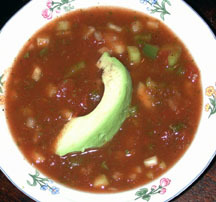 These low-calorie, home-made soups/snacks are a great way to cut the fat, calories and EXPENSE out of your daily meals. Workout, then take your post-workout snack or next meal with you! Or just pick it up on your way to/from work! What a great way to eat healthy and know the ingredients in what you are eating! Pickup at the Studio for $3/serving (plus $1 red container deposit if recycling). Pickup coordinated on the days listed on the menu. Local Delivery: $4/serving ($12 minimum per delivery). Qty discounts available. Why not try them out and decide if you want to make them yourself! And don’t be greedy, bring some for your co-workers or family. They might want to order themselves next time. The more people order, the more Caring Cuisine can continue to provide your healthy meal alternatives! To start the week, we are serving a Spicy Sweet Potato Soup. The toasted turmeric, coriander, and cumin in this Indian-influenced soup has a soothing anti-inflammatory benefit, and its extremely low in fat but big on flavor. Next, is our favorite Sesame Green Beans. You know you love it! It’s a refreshing way to eat a cold green bean salad!You’ll never get bored of our Homemade Hummus w/ Pomegranate. Filling, nutritious, and yummy. It’s great as a dip or a spread for a wrap.Later in the week, try our flavorful Simply Veggie Soup. There is just something different about it that makes it soo good!! Have you tried it? It’s what launched Caring Cuisine, so ya better order some!Along side, is another long time favorite, the Mediterranean Lentil Salad. Not sure you like lentils? I will forever change your opinion of the flavor of lentils! Served cold and eaten with passion! Local Delivery: $4/serving ($12 minimum). Qty discounts available. Please be patient on availability/timing on this! Thanks to http://www.okreach.com/, my logo/tagline is being souperized! Thank you so much for knowing more than we do. We like to make our branding/message sour in a souptacular way in the South Bay (and then globally!). But please, don’t cry for me Argentina! I’m still the neighborhood girl who puts love in her food and brings you healthy soups, sides, and snacks at affordable rates. I think the biggest change is a future deliver service and a SOUPSCRIPTION where you can order/pay for your food online. Ya like? Its Monday night and I’m getting beans soaked overnight. Planning my Farmer’s Market shopping for the morning to select perfect eggplant, red peppers, pineapple, cilantro, green onions and more so. We worked on the logo so that it will display on container labels clearly. Also worked on a focus group questionaire to get valued feedback on our product and plans.